Samuel Sharpe, a Creole slave, was born in Montego Bay in 1801. Although he was a slave he had learned to read and write and he read many newspapers. He learnt from the newspapers that some people in England wanted to end slavery. He joined the Baptist church that was also against slavery. The Bible told him that all men are equal. It also says," No man can serve two masters." Sam Sharpe thought all slaves should be free, and he told the people at his church. He spoke what was in people's minds, so they listened to him. He wanted the slaves to do something to become free and he had a brave plan. He did not want the slaves to fight. He wanted them to sit down one day and do no work until they got paid for their work. At church he told people about his plan and they went to other churches to spread the word about it. He knew that ripe cane must be cut quickly, or it will spoil. As the cane would be ripe after Christmas, Sharpe wanted the slaves to sit down after the Christmas holiday and do not work. He thought the owners would pay the slaves to cut the cane, so it would not spoil. He was the first Jamaican to make a plan for people to stop work, in order to get paid properly. Some slaves were very angry and did not want to try Sam Sharpe's peaceful plan. Instead, just after Christmas in 1831 they burnt Kensington Estate in St James. Then other slaves burnt many other estates. Some slaves got guns, but mostly they tried not to hurt owners. However, a few of the owners were killed. The Government sent soldiers to the estates. The soldiers killed some slaves and took many others as prisoners. The slaves did not have many guns and they had no military training. They were not organized, and they had not planned how to fight. When the prisoners were taken to court their owners spoke against them and more than 300 slaves were executed. The missionaries were against slavery so he thought they would help him. However, they tried to stop him because they knew that most of the estate owners did not want them in Jamaica so they had to be careful. Some slaves followed Sharpe's plan the peaceful sit-down strike - they did not work. But the plan failed because some of Sharpe's followers burned estates and used violence. He gave himself up and was charged with rebellion as the Government and the estate owners believed he was a rebel. He was taken to court, convicted and put in prison. 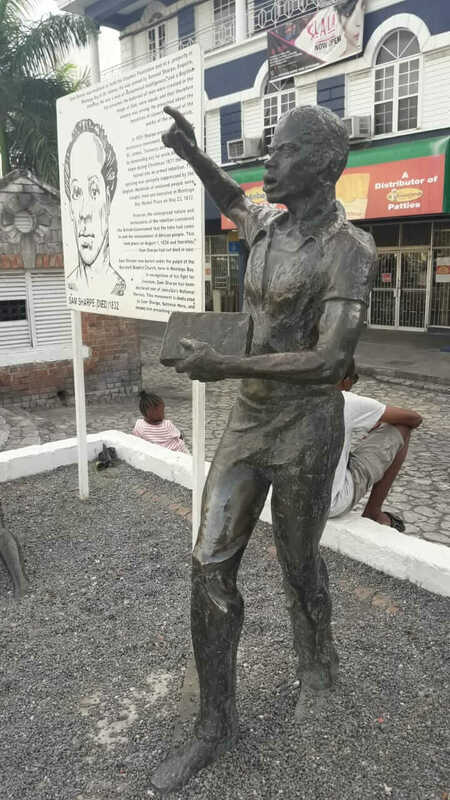 He was executed in Market Square in Montego Bay in 1832. The Christmas Rebellion of 1831 was the last big fight against slavery in Jamaica. The Government in England knew that the slaves would not put up with slavery any more. Most people in England also wanted to end it and slavery was abolished in 1834. They helped to make the free Jamaica we have today. See also: Why is Emancipation Day Celebrated In Jamaica?